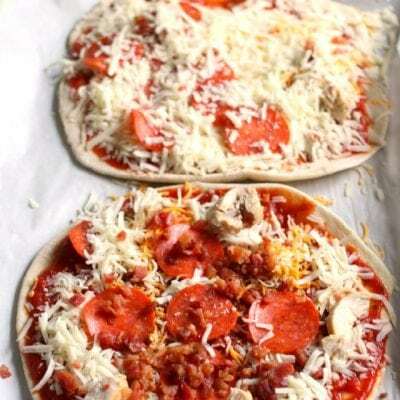 This pizza dough recipe makes a simple and deliciously chewy homemade pizza dough that will be an instant hit at your house! We’ve been making this pizza dough recipe for over a decade and haven’t changed a thing about it. 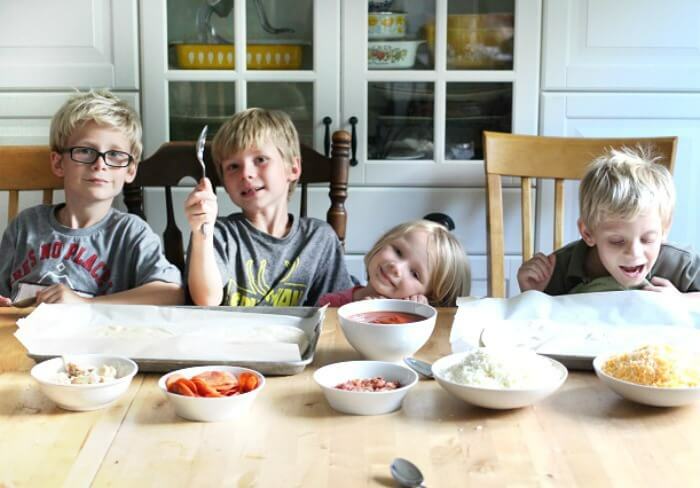 Before we had kids, we would invite friends over after work to do make-your-own pizzas and we’ve now continued the tradition with the little ones. 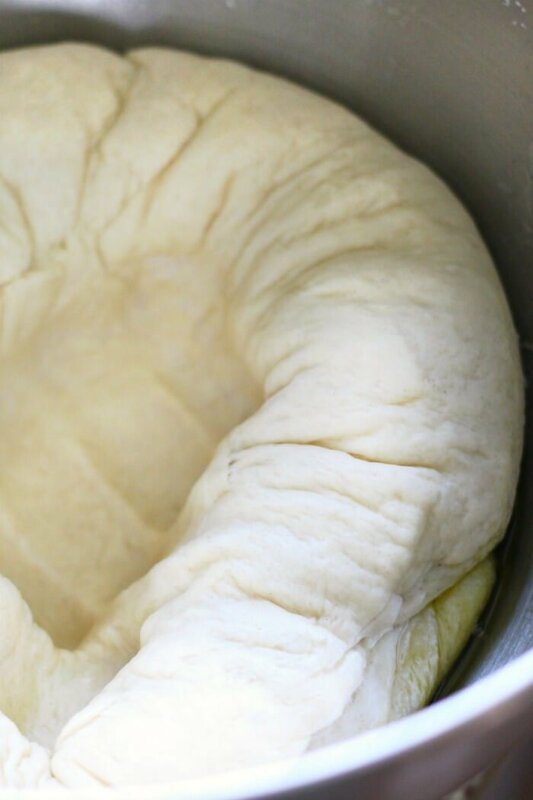 I love to make this pizza dough recipe ahead of time and freeze it. We serve our homemade pizza with a simple spinach salad and peanut butter chocolate chip cookies for dessert. Warm water – the water bears mentioning because you’ll need to warm it to between 110-115 degrees. The trick though is to look at your water heater and see what it’s set for. Ours is set to 110 degrees, so I just run our water on hot and then use that! Active dry yeast – active dry yeast is available in both single packet or jar form. Either option is fine, but make sure you get regular active dry yeast and not an instant. Sugar – just a little bit of sugar, this will help the yeast proof (get all bubbly). All purpose flour – regular old all purpose flour. No need for the fancy self rising. Self rising has salt and baking powder in it, so you don’t want those extra unnecessary ingredients. Olive oil– vegetable oil will work in a pinch, but I love a good strong flavored olive oil. Mmmmm. Salt – it’s incredible what a pinch of salt will do to light up the flavors in a recipe. Don’t skip the salt! How do you stretch pizza dough? To stretch pizza dough, you’re going to want to start in the center and stretch out to the edges. I like to use a rolling pin to roll out my pizza dough recipe, but hands work too. 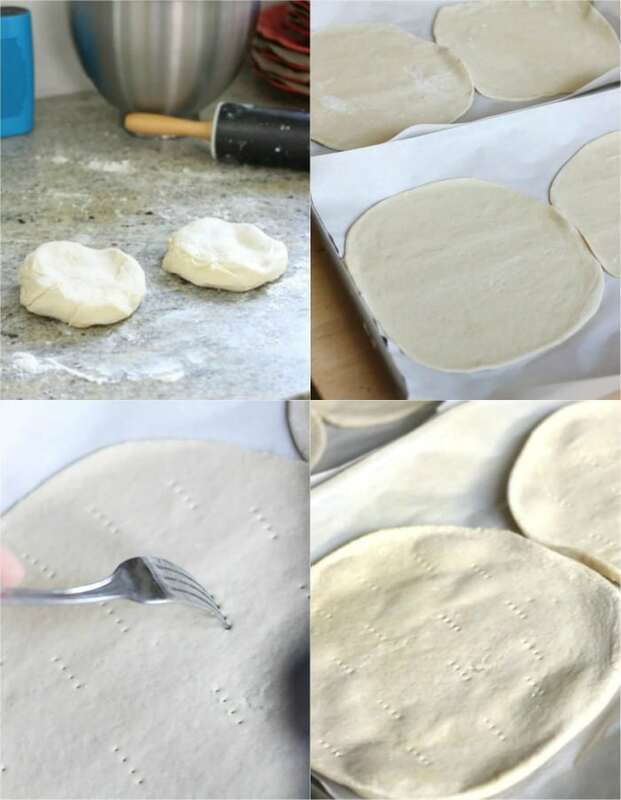 Make sure to flour your surface, rolling pin, and hands first! If you’re super talented, go ahead and try twirling over your head like they do in the movies. But I also suggest having a spare bit of dough in case it falls. Haha! Can you freeze a pizza dough recipe? 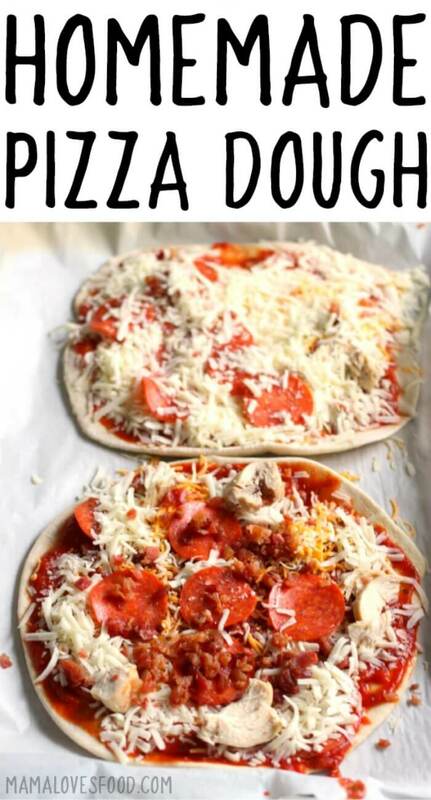 Yes you can freeze pizza dough! You can freeze it at a few different stages (before baking, after par baking, and after topped) but we like to freeze it after par baking. Par baking is when you partially cook something. This way when you pull it from the freezer it’s ready to be topped and then gobbled up, and you’re not pigeon-holed into a particular type of pizza! Our pizza dough recipe is vegan. 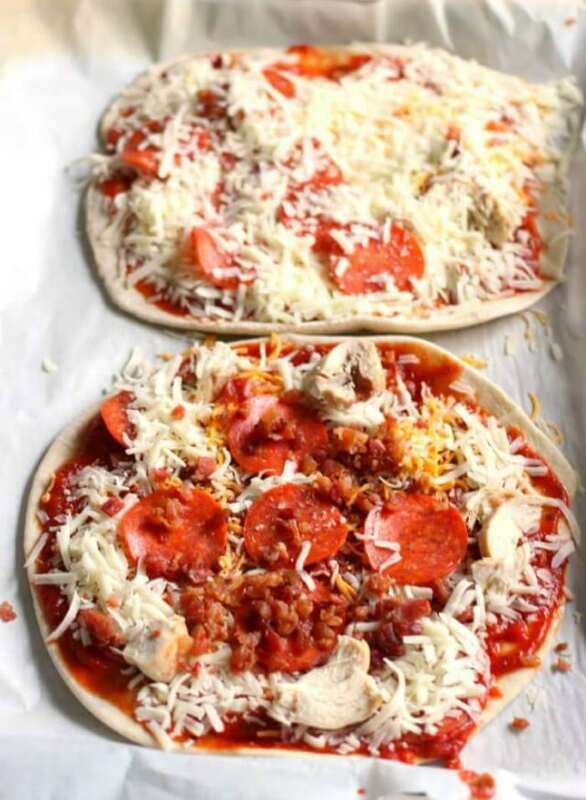 None of the ingredients for pizza dough contain animal parts, products, or biproducts. For a fully vegan pizza, I love to use pesto or olive tapenade and then pile on fresh veggies, garlic, and onion. Yum! Pepperoni, sausage, bruschetta, peppers, onion, olives, ham, pineapple, caramelized onions, bacon, olive tapenade, meatballs, barbecue sauce, pulled pork, roasted garlic, artichoke hearts, goat cheese, beets, mashed potatoes, spinach, alfredo sauce, cilantro garlic sauce, eggs, curry mustard, chicken, kimchi, feta, salsa. Pizza Stone – pizza stones make a deliciously crusty pizza. Make sure you put it in a cold oven to start. We like to use ours on the grill. Cast Iron Pizza Pan If you’re not a pizza stone person, this cast iron pan is another great pizza pan option! Pizza Cutter – I mean, you could use a regular knife, but then would it be an authentic pizza? KitchenAid Classic Stand Mixer – I love this with the dough hook attachment for kneading. Dissolve yeast and sugar in warm water. Allow to proof (get frothy) for 15 minutes, then add olive oil, 2 cups flour and salt. Add remaining flour until dough is rubbery and slightly tacky, but not firm. Knead dough on a lightly floured surface (or in your stand mixer with a dough hook) for approximately five minutes. 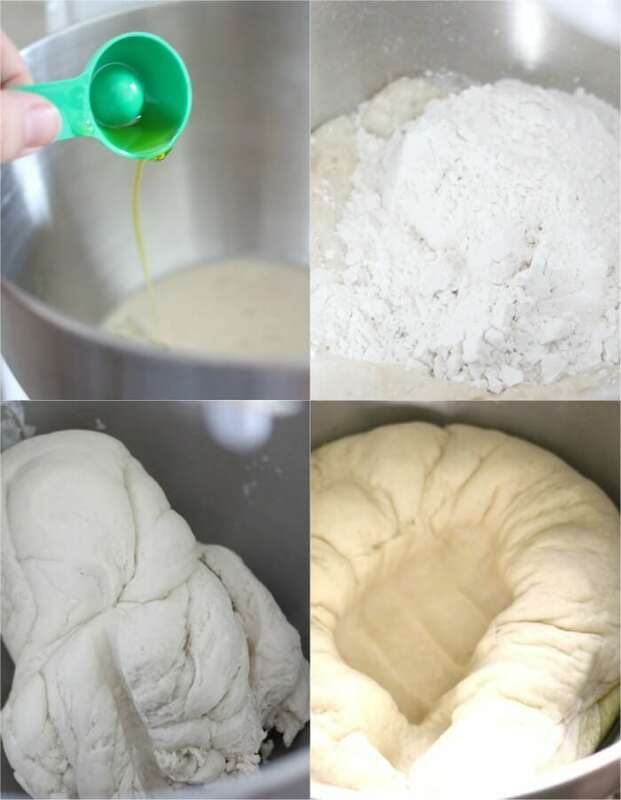 Form dough into a ball and place in greased bowl (turn once to grease top and bottom). Cover and set in a warm place for one hour (I put dough in my oven with the light on). Roll dough into preferred shape on baking sheet or stone and brush with olive oil. Stab several times with a fork (go ahead, take out your frustrations!). Bake 5-7 minutes. If you want to freeze your crust, allow it to cool and then do so now! Top as desired and bake an additional 15-20 minutes (or until crust is lightly browned). If you prefer a crispier crust, you can remove it from the baking sheet and do this part directly on the oven rack. i LOVE buffalo chicken pizza!!! Those look so good! I want the white pizza! Wonderful post! I love your pizza. And the kids are adorable! Thanks for sharing. Greeting from Melbourne, Australia. Thank you for this fantastic recipe. For the first time, my husband and i made pizza dough and it worked perfectly. Never again are we buying pre-made bases. You have a life long follower in me! I have even sourced the Chipotle Tabasco sauce to try out your meatball recipe. I will let you know how that goes! 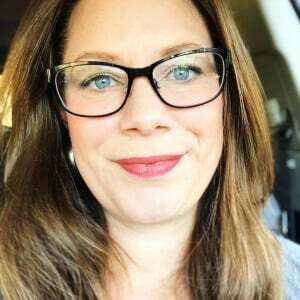 Really Interesting site thanks for share your information. So tasty! I will try it when I have time. Thanks for sharing that. 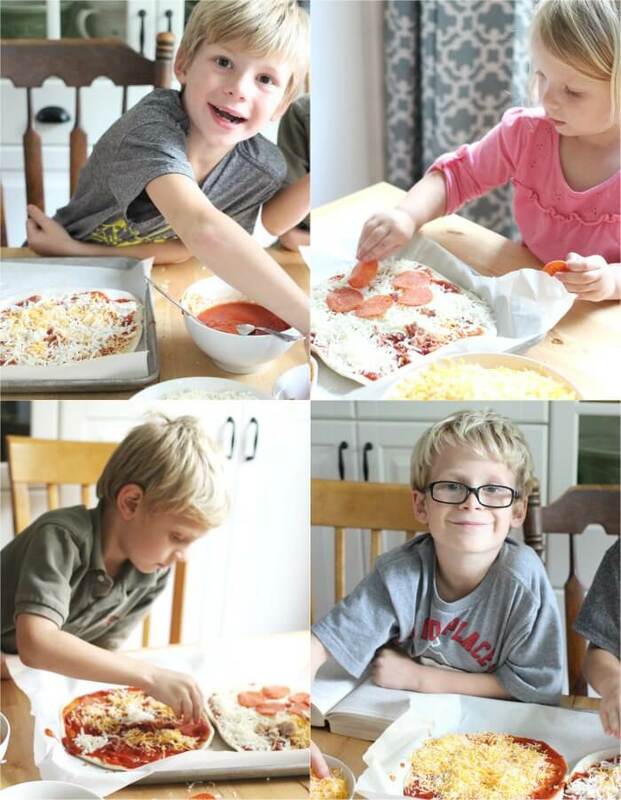 We love making homemade pizza and this dough is fabulous, way better than the storebought stuff! Nothing beats a homemade pizza with homemade dough! These pizzas look amazing. Can’t wait to try it!